The Presidents of the United States of America released their eponymous debut album in 1995. Zamfir-like, they enchanted millions, often with their permission. PUSA has since circled the globe repeatedly, spreading their trademarked exuber-rock message to these millions, one sweaty happy rock box at a time. PUSA has singlehandedly brought much-needed musical recognition to their previously COMPLETELY UNKNOWN hometown of Seattle, WA. PUSA are notoriously punctual. Rube-like, they routinely show up 30 minutes early to even the bleariest of dawn TV “Morning Show” appearances. PUSA once shook hands with Bill Clinton, and later pronounced the experience a “full body sexual experience.” They have lost multiple Grammys. 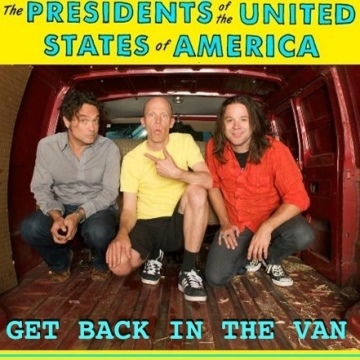 PUSA are currently playing their debut in full on the “PUSA Plays The Good One” tour in your city, or perhaps one you can easily drive to.